I have always been fascinated with cars. My first was a 1948 Ford Coupe with a frozen engine which I picked up in 1955 in my home town of Alameda, CA for only $50.00. At the time, I was 15, had no license -not even a learner's permit - because I was under age. I used paper route money to buy it - thank you Oakland Tribune! I pulled and rebuilt the engine myself which was common for a teenager living in California in the '50's -- American Graffiti -- I lived it! And, the movie is true except that we cruised drive-in restaurants in Alameda, Oakland and San Francisco, CA, (Tiny Naylors, The Plaza, Mels [of American Graffiti fame] and The Grand). By the time that I was finished with the engine, I had a drivers license and used to get up extra early to make sure that I could get a parking space in front of Alameda High School so that I could be seen leaving in MY car -- status symbol! (No parking lot -- city streets only -- and I lived only two blocks away!) Ah! to be in high school in the '50's in California. I drove it for a couple of years until I got my used 1957 Ford - the best Detroit iron I ever owned because of terrific horsepower to body weight ratio. T-Bird Special engine in the lightest body offered that year. Never lost an impromptu drag race. During this time, one of my fraternity brothers (Sigma Phi Epsilon ) at the University of California, Berkeley - had a Healey and it was a love affair from then on. (Go Bears! beat Stanford!) Some current Healey friends of mine actually know some of my High School classmates! And, classmates of my sister who attended while I also was there were Jim Morrison, founder of the Doors and Sharon Tate of Manson Family infamy.Their fathers were an Admiral and Brigadier General respectively swinging through the military bases in the Bay Area. Also Debbie Fields (Mrs. Fields Cookies) (Check Wikipedia). I have photos of them in the High School yearbooks which I have saved. Small World! In 1995, my company was bought and the corporate headquarters was moved from the New York City area to Colorado. One day my wife and I were traveling north on Broadway from the Highlands Ranch suburb, where we lived, towards downtown Denver when she said "Look at that!". Having seen it out of the corner of my eye, I was already prepared to make an illegal U-turn to the used car lot. Bear in mind that Broadway at that point is three lanes in each direction and I was in the far right. After returning hand gestures to the people that I had cut off, I parked behind a 1958 Austin Healey BN6 that was on the street in front of the used car lot. It was, indeed, for sale. Year I graduated from High School -- loved Healeys in college -- would you resist? Me neither! At that time, we had our boat up for sale at a brokerage in Philadelphia, PA since it is rather difficult to do ocean cruising in the suburbs of Denver as we did in New York. My wife facetiously said that if I sold the boat, we could consider buying the Healey. (At that time the boat had been at the brokerage for three months with no nibbles). She knew about my long time love affair with Healeys from my fraternity brother in the late 50's - early 60's, to the time that my neighbor had a Sprite in the mid 60's and to my failed attempt to restore a BJ8 in 1980. I immediately called the brokerage in Philadelphia, lowered the price drastically and told them that they had 3 days to sell the boat. They did, I bought the Healey and here we go. We retired to Las Vegas shortly thereafter and I loved to drive the Healey up and down the Strip invariably getting comments such as, "I had a (insert uncle, cousin, friend, etc.) who had one". And, comments such as "can I have a ride with you?" - NO. Driving across Hoover Dam into Arizona invariably brought many requests from pedestrians walking across the dam for fotos -- given. I even have a photo of a tourist taking a photo of me in the Healey. My next door neighbor refused to ride in it because it has no air conditioning. Sucker! Air conditioning in a Roadster? Get Real! After several years in Las Vegas, we moved to New Jersey to be with our soon to be born grandson who loved to ride in it. This site has articles that I wrote for Austin Healey Magazines, published by the various Austin Healey Clubs, under the by-line of "The E-Mail Mechanic©" as well as a photo album of any and all repairs, restorations and other items related to my Healey and to all other models. Esoteric technical items are in the "Technical" page with additions added several times a week. Another page of interest is the "Important Links" page which has links to sites world wide for clubs, technical information, parts, general interest and the like. If you have a Healey, look at the "Local Parts" page for locally available items or the "Parts Suppliers" page for links to our very fine parts vendors. Photos of restorations of all models have links on the "Links" page, Restoration Photos section. Technical Bulletins of the period are on the "Bulletins" Page. And the Clubs page has a listing of Austin Healey clubs world-wide as well as the registration requirements for each State. So, sit back on a rainy afternoon and take a peek. Unfortunately, as one grows older, life dictates that changes are necessary. Budding arthritis to my hands make it difficult to grasp tools for any length of time and the shoulder makes operating a floor jack difficult. I knew this would happen as I was, at one time, a golfer who routinely shot in the low 80's but about ten years ago had to give it up because I could not grip a club after the fourth hole. I recently had to install new cables from the batterys to the solenoid and from the solenoid to the starter. This simple act took me almost two days to perform -- to lift the car, crawl under it, back to the top, crawl under again and lower the car. And, all this to drive the car about one half an hour by the end of July because of terrible East Coast weather and the length of time and expense to make repairs and routine maintenance. The car is in much better hands now. Oh Yes. The best sport! All games are 15s unless otherwise indicated. I have deleted the game by game scores. 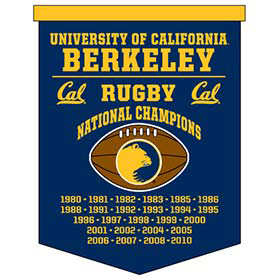 Frankly, Cal rarely loses a rugby game and are undefeated in 2015 adding several more titles in both the 7's and 15's versions of the game. Fight for California. University of California, Berkeley Fight song. Go Bears!